Hi gang! I'm back with another project. 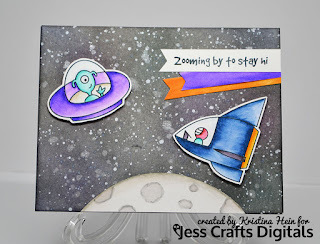 This time I'm sharing the newest release from Jess Crafts Digitals! Jess has been coming out with some of the cutest digi sets lately. Seriously, check out her Etsy page here. 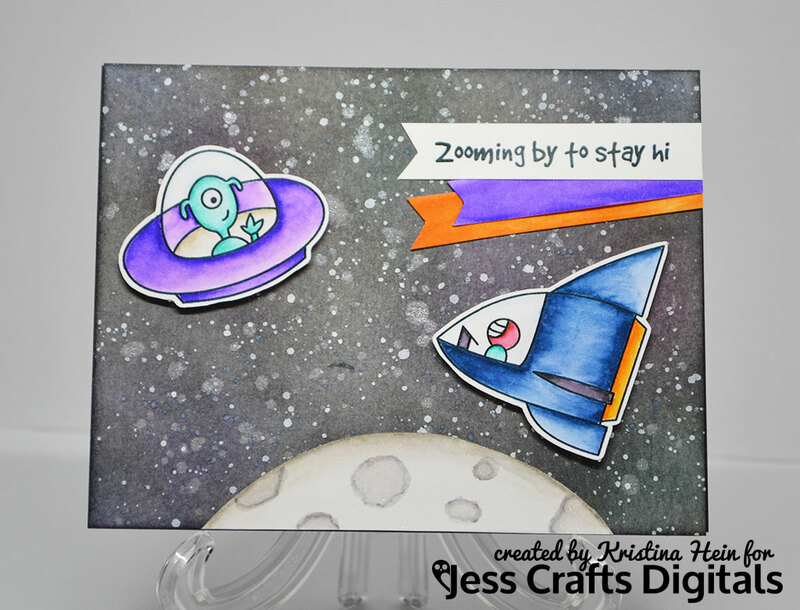 Today Jess is releasing Space Invaders-Alien and Astronaut! It includes four really fun sentiments too! I knew that these digi stamps needed to have a galaxy background of their very own. How I love to make them with distress inks! I get to make a mess that turns into something wonderful. Not to mention adding all of those splatters. Makes my crafting soul happy! I used Wilted Violet, Picked Raspberry, Blueprint Sketch, Mermaid Lagoon and of course, Black Soot. I created the first set of splatters with water mixed with Perfect Pearls. The shimmer really makes me think of stars! And the second set of splatters was made with diluted white paint. While I set that aside to dry, I got to work on coloring the stamps. I brought out my trusty Zig Clean Color real brush markers again. I just love how easy they are to work with on Bristol paper. The first time I actually colored them with Copics but just couldn't get the look I wanted. I'm pretty sure it was user error though, not the Copics. My Zigs never seem to disappoint. I used the some of the same markers to color strips of paper to match and hand cut the little banners to go behind the sentiment. I thought they definitely needed to be flying over a planet or a moon so I just created my own! It was also colored with the Zig Clean Color markers. I added Spectrum Noir Glitter marker to the craters in the moon, the alien, the astronauts mask and the rockets. I did use foam tape to pop up the alien and the astronaut. And there you have it! Head over to Jess Crafts Digitals Etsy page to snag this awesome set for $1. It's a special price for a limited time only.